Each of these programs serves to help you create adventure AND stability in your life. So you can feel confident as you actively choose your passions and your priorities while creating tremendous momentum around what you really want. Access my free guide on how to create a life of momentum, passion and magic! My gift to you. For Career Changers tired of missing out on the life you wish you had because of the sacrifices you have to make for a job you hate. Reconnect to your core self and find momentum in a career you love. For business owners ready to create momentum in your marketing. Master your message. Gain visibility. Connect with your customers. Create systems and packages that support your success. For my adventurers. Reconnect to your natural self. Awaken your adventurous self. Embrace your strengths. Own your confidence. Amp up your communication. Connect to what makes you feel alive. I have waited two years to work with a coach/marketing professional because I was searching for the right fit. After my first meeting with Katie, I knew she would be the one to help me in taking my business/passion to the next level. 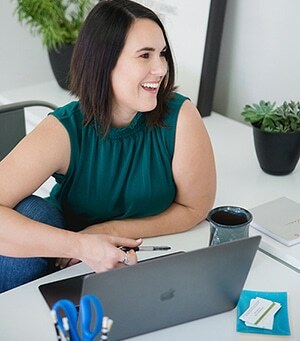 Katie is an expert in her field and has provided me with the right marketing resources and tools specific to my business. Katie helps me establish monthly attainable goals to which I am focused, on task and prepared to accomplish. She keeps it real for me, which keeps me in balance and harmony with my long term business goals. She is such an incredible encourager. Just when I feel like I haven’t accomplished all that I should have, Katie is quick to remind me just how far I have come and accomplished thus far. I love working with her and would recommend Katie to anyone wanting to grow a successful business. Katie excels at bringing to light what is hidden in each of us and yearns to be set free … a true gift! Katie’s attitude toward her life and career is an inspiration. She was my coach through a time in my life where big changes where coming about. She helped me through that time with professionalism, compassion, and integrity. She helped me to cut through emotional barriers and see things as they were. I look forward to working with her again in the future. Every time we talk, she makes me think, she asks the hard questions. I don’t always want to answer them, or even think I know the answers, but the results come every time.